Rocco is now able to enjoy our deck and catch some rays. He is settling in nicely, and will play fetch with our BT Wendell. His skin has mostly cleared. This boy is a sweetheart and loves to be with you! He will make a great dog for a lucky family! What is so amazing about this video? One of the runners is blind and it is not the human. This just goes to show that dogs have a remarkable ability to overcome a handicap given love, patience and trust. Flo never ceases to amaze me. She cannot see or hear but she has so much life in her! When the leash is on, I am her eyes. Aww Jerrilyn Walter, Flo IS a happy girl because she has you as her Mom!! Love Flo!!! Also- how cute is that little tush going down the stairs! My Little Buster Boy, 10 years old adopted in 2013.I just love him. He is here with my Nikki Nik-who is suffering from DM and doesn't have long to live. Our beautiful big boy Prince was adopted today. We will miss him dearly but he will be living a life of luxury in a gorgeous home with a wonderful family. Congratulations! Looks like a very happy ending! Great Job!!!! Thank you for all you did for him. In a couple weeks it'll be 5 years since we adopted Piper, who turns 11 on Sunday. When we adopted Piper, she was skittish around people and dominant of other dogs. She calmed down a lot in the first year or two as she learned she was safe with us, and now is getting even more easy-going as she settles into her golden years. She gets along well with her new brother Pigeon, a younger Jack Russell we rescued about a year ago. Over the years, she's had a couple small skin tumors removed (with good results), a bout of giardia, and a scratched cornea. Her cataracts have gotten worse as she's aged, but she still has enough vision to get around on her own, and can still run as fast and jump as high as ever. It ain't always easy being an active Boston, but she's been doing great recently-- very good health this past year, knock on wood! Thankfully, she's gotten much tolerant with vet visits, and has always been good with letting me clip her nails and brush her teeth. These days, Piper has a lot more gray hair on her face, and the skin on her neck is drooping lower, but she still loves cuddling and lounging in the sun, and her memory of where on the next block the old man who pets her lives is still 100%. Here are a couple pictures from this past year. Thanks again, we couldn't imagine life without this little weirdo! Spike has only been living with his forever family for 6 days, and he's already got the hang of thing. Look at the photos sent in by his new family. They are so in love with Spike and we think the feeling is mutual! Marty Gets his new dog food today!!! NEBTR would like to give a very special thank you to Nature's Variety - a small, independent pet food company in the midwest. Nature's Variety is dedicated to proper, holistic nutrition for pets and they just gave a very generous donation of their dog food to NEBTR for our foster dogs! Our rescues need a healthy diet just as much as they need love and shelter. Thanks Nature's Variety! Our partner in rescue! Erin, you have to be so proud of what you did for Dash. We are! Pink is our darling diva. She loves being cozy under the blanket, long walks in the woods,chasing squeaky toys and balls and trying to get her French bulldog brother to roughhouse with her! Here is "before" and "after". 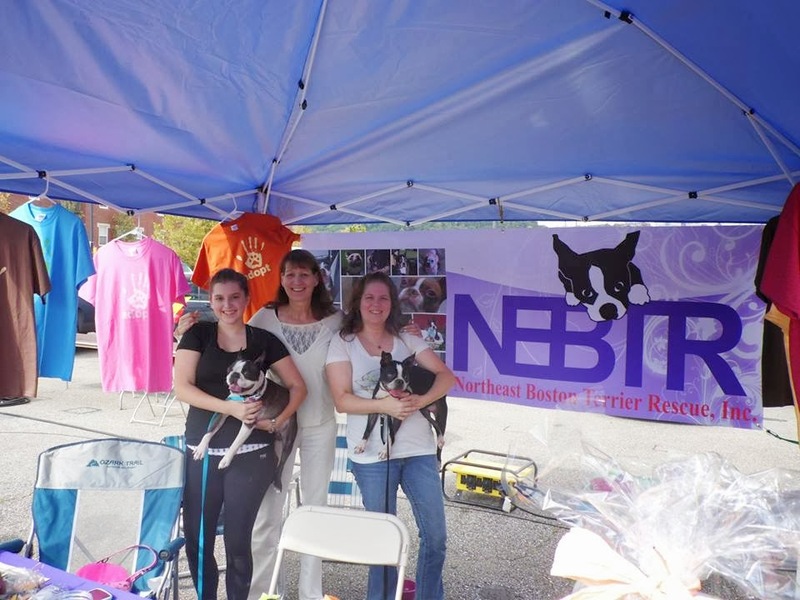 NEBTR was well represented yesterday at the annual DogtoberFEST super-adoptathon in Pittsburgh yesterday. Over 70 shelters, vendors and rescue groups came out in support of adoption and to educate the public about the good work being done. 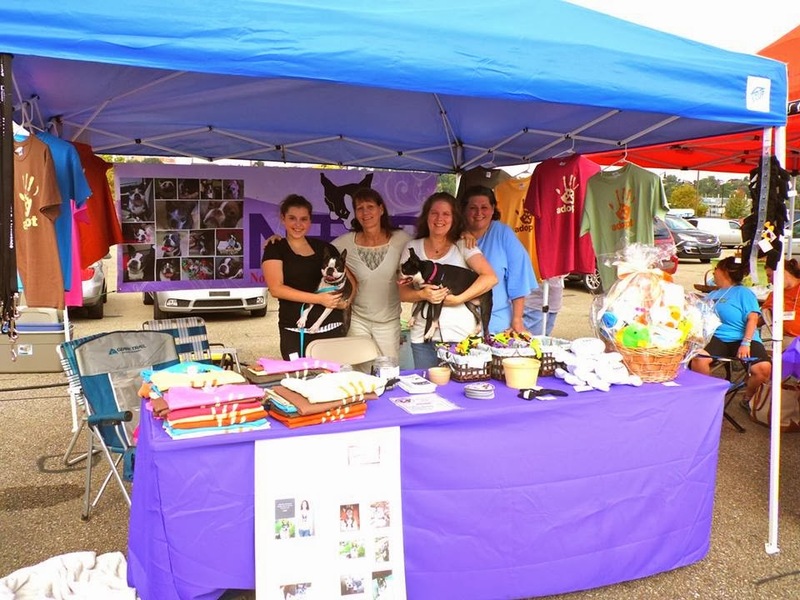 Many thanks to NEBTR members Leslie Kaucic and Kristy Ieraci, who brought their family members and foster dogs out to show attendees the great dogs that are available from rescue and talked up NEBTR!. The booth also made a respectable $155 for the organization. 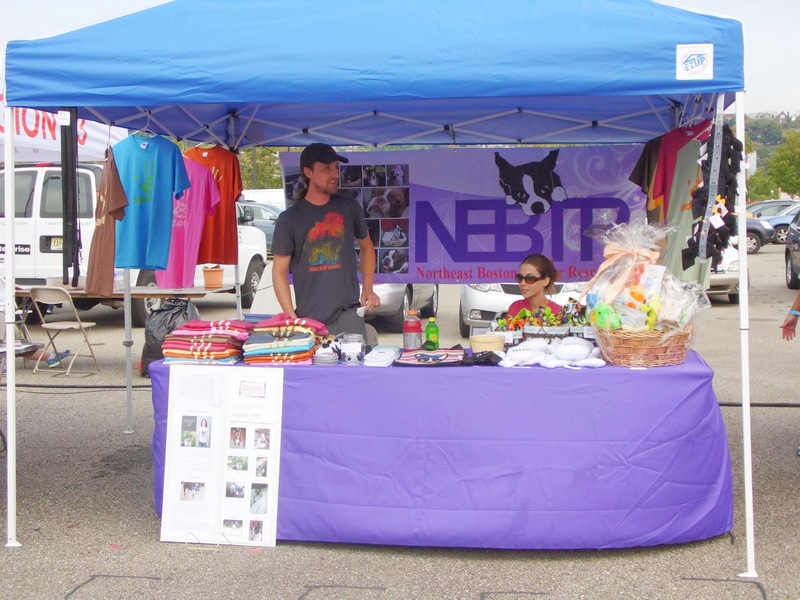 Enjoy some of the pictures below, and there are more of the NEBTR booth coming shortly from the event photographer. PS - I'm in the back row of the Ask the Trainer booth! Thanks so much to all who participated and helped out for NEBTR. The booth looks wonderful! Here is a pic I snapped of the table with Kristy and her foster Cleo, Jeff's hiding lol. And Mandy, we kept her in the crate behind us so she'd feel safe. She did ok! Our own April is in the back row of this booth. Welcome new foster Dooley. Poor Dooley has had a sad history. His first owner committed suicide. Then he was adopted by a lovely lady, but her financial condition made it impossible for her to give him the care he needed. He needs medical and dental care, and is in pain. It is time for Dooley to get the care he so badly needs. He is about 9 years young and ever so handsome! He is loving sweet boy. Any one who meets him will definitely fall in love with him instantly. Thanks to Conni McGraw for opening her heart and home to him. His life will never be the same again, it will forever get better! Loving life with her Forever Dad Walter Williams! Welcome our newest firecracker Rocco. Rocco is a 6yr old Boston Terrier. This big boy is 30 pounds. He loves long walks. Rocco is being fostered near Saratoga N.Y. What a handsome guy! Snorky is such a handsome fellow. This was a rare occasion for him to sit still and pose for a picture. I think he was just resting after our game of fetch. Notice the ball laying beside him. He never lets it out of his sight. Today is my one year Gotcha day. Thanks NBTR for saving me from that awful shelter and for finding the Miners, my forever parents. Happy Gotcha Day Zoey! You are one lucky girl! Happy gotcha day to my sweet Zoey. A year ago today I drove to Syracuse and met a volunteer from Nebtr. She had picked up Zoey from a temporary foster in Albany. In her papers from the SPCA they said she was so scared it took four people to hold her down when they checked her in. They said she cried and cried. When I got her she was a very frightened little girl. It was a tough few months getting all our pups to adjust to each other. But today they are all great friends. Zoey has turned int an affectionate little love bug. Every night when I come home from work she races to the front door and gives me kisses. No matter how tough my day has been my little sweet heart is right there to brighten my day. 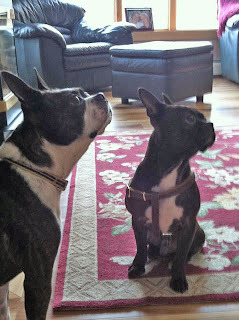 Thanks North East Boston terrier rescue for our little sweetie. Welcome Frankie, a five year old boy from a Pennsylvania shelter. Thanks so much to Sarah Perrone-Scheffler for opening her heart and home and fostering this boy, and to all those who helped with his transport! We wanted to let you know that Max, our 12 year old "failed foster" was sent to the rainbow bridge on October 2, 2013. He brought joy to our house for the last two years. His sisters, Flower and Stella keep looking for him. Attached are two pictures of Max. Our deepest sympathy,Vicky and Fred, on your loss of this beautiful friend. Remember the love, Max was Loved! Thanks again. Your words help!